The /9 was the close support version of the Sd.Kfz.251. It was produced both as the Ausf. C and the Ausf. D subtype. It had a crew of three: driver, gunner and loader. The Ausf. C, which interests us here, was produced from June '42 till May '43; only 156 were built before production moved to the Ausf. D.
Early Ausf. D used the same mount as the Ausf. C, but switched to a higher mount in December '43. As we currently do not have an early Ausf. D in plastic, this kit might serve as a donor for a fairly straightforward conversion using a Hasegawa or (preferably) Dragon Sd.Kfz.251 Ausf. D.
An interesting article about such a conversion by Stephen Brezinski can be found here. The tracks are of the link and length type, which are well rendered, but would need a gentle pass of the scalpel to open up the "mouth" of the track ends, in order to welcome the other track part that fits into it. An open topped vehicle really needs an interior, and Revell caters for it. 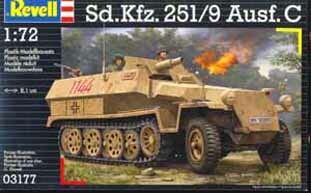 As the interior shares many parts with the other Sd.Kfz.251 Revell offers, some shortcuts have been taken. To have a correct vehicle, you will need to leave off the right hand seat (for the co-driver) and lower the backrest for the driver. The /9 was quite crowded, and it was notably difficult getting to the front of the vehicle. You might also add something to represent the vision blocks on the inside of the visors in the driver's compartment. Talking about the antenna mount, it seems it was installed on the left side of the hull amidships or to the right rear on late Ausf C's. The kit has it at the front right, close to radio, which makes sense to me. The benches for the crew apparently were leather-cushioned on the Ausf. C, while Revell seems to have gone for the wooden slat type of the Ausf. D. I didn't feel like modifying it at the time. There are some ejector marks on the inside of the rear doors, which are not that easy to remedy. Most other ejector marks are well placed. While the lower part of the gun mount is not 100% correct, it will do the job, and the top part is actually quite convincing, if fiddly to assemble. Tthe basket for spent shells (Part 84) is provided; this is an item often overlooked by manufacturers. I drilled out the business end of the barrel by just a hair to give a bit more oomph. When assembled with care, the gun can be made to remain movable in elevation, which raises the following question: wouldn't the optics move with the gun ? The kit has them in a fixed position. Note that there was no coax-MG mounted on the /9 Ausf.C, so Revell didn't forget it. On the other hand, they provide two anaemic MG42, which are out of date for this vehicle. MG34s would make more sense. - slits were added in the lateral visors. (They are present in the forward visors, but Revell overlooked this detail for the lateral visors.). I am not quite sure if the instructions are correct when it comes to the placement of the axe. It might have been mounted in the other direction, and it might have actually been mounted on the fenders, instead of on the hull sides. Filling in the holes for receiving the tools on the underside of the fenders might also enhance your model. When you come to step 25, it's best to obey the instructions and install part c50 (top of the muffler). I had hoped to able to leave it off until the end, end ended up regretting it. I had also hoped to be able to leave the gun assembly off until after painting, but the top of the gun shield makes it almost impossible. I also found the rear Notek light to be a bit poor, and while I have resin parts in my spares box to replace it, I wanted to build this kit as much out of the box as possible. One of the panel lines which I added. The Zpw 5001/280/140 tracks of the Sd.Kfz.251 (and Sd.Kfz.11) were 280mm in width. The tracks of the kit scale out to 252mm, which is close to that of an Sd.Kfz.10 (or Sd.Kfz250. for that matter). Incidentally the MK72 Sd.Kfz.10 tracks scale out to 281mm, which is almost the exact width for this Sd.Kfz.251. The track units are slightly too short from sprocket to idler, as they scale out to 1/70-1/71. I did some other measurements, and found that the vehicle is slightly too narrow (1/74), with the top of the crew compartment being closer to (1/81). All this makes that the vehicle looks a bit narrow for its length. The height of the rear doors scales out to 1/65 and road-wheels are somewhat 1/76-ish. In my preview I expressed my fear that the white outline of the "523" marking might be barely visible and perhaps spurious. Well, that was unfounded, and it shows very well indeed and Nuts & Bolts confirms its existence. The vehicle ended up with a liberal coat of mud, as it would appear during the onset of the rasputitsa in the fall of 1942. Only later on I discovered that 7th Panzer Division wouldn't be toiling through the mud at that time as it was being refitted in France, from May to December 1942. In January 1943 it was held in reserve on the Eastern front and only saw action again in February of that year.